Over the last few years, Afghanistan has started to realize the importance of drafting policies and strategies for the renewable energy sector with the help of the international community. However, the focus has been mostly on electricity generation with a limited focus on affordable and efficient cooking and heating devices run on either renewable energy sources or traditional biomass. Table 1 shows the list of the documents that relate to renewable energy development drafted by the government and international community. The following sections in this article summarize some of the below documents. However, in the long-term, EES recommends the government to focus more on cogeneration, distributed power, renewable energy, end-use energy efficiency, and more traditional energy supply schemes. EES emphasizes significantly on the reduction of subsidies on projects and implementation of energy projects that generate income for the households and not just meet their basic needs of lighting. However, the neediest will still gain access to energy through subsidized rates. Table 2 summarizes some of the main outcomes and activities of EES regarding institutional and policy building in the energy sector. Table 2: Parts of Energy Sector Strategy (ESS) action plan. NESP is one of the 22 National Priority Programs (NPPs) that was agreed upon at the Kabul International Conference in 2010. NESP is one of the four NPPs under the Infrastructure Development Cluster. NESP tries to show the impacts of investment in the energy sector especially in the electricity subsector on the economic development of Afghanistan. MEW is the primary executing ministry of NESP. However, MEW is expected to coordinate and cooperate with other related ministries and institutions such as DABS, MRRD, MAIL, and NEPA. The main goal of NESP is to prepare and implement activities toward increased energy access and sufficient, reliable, and affordable energy especially electrical energy. NESP has identified five major areas of investment in the energy sector and MEW is responsible for reporting progress made to the review program coordination board and Joint Coordination and Monitoring Board (JCMB). NESP is planned to be implemented during the period of Jan 2013–Dec 2014. The cost for the plan is estimated to be around USD 3.5 billion. Table 3 shows the five components of NESP with corresponding budget requirements. Table 3: NESP components and estimated budget. NWNRD is one of the four NPPs under Agriculture and Rural Development Cluster (ARD). MEW, MRRD, MAIL, and MCI are the principle ministries of ARD Cluster. The goal of NWNRD program is to ensure the effective utilization of water and other natural resources and their proper management to foster agricultural productivity, safe drinking water, and viable rural energy options. One of the main objectives of NWNRD program is to improve energy access in rural areas in order to improve livelihoods and create new sustainable jobs. Table 4 introduces the two components and subcomponents of NWNRD with their estimated budget. The budget for the components would come from donor funds channeled through either ARFT (Afghanistan Reconstruction Trust Fund) or a special account. The main component dealing with energy is C1:SC2: Energy for Rural Development. The goal of the energy subcomponent is to increase access to modern sources of energy in rural areas. 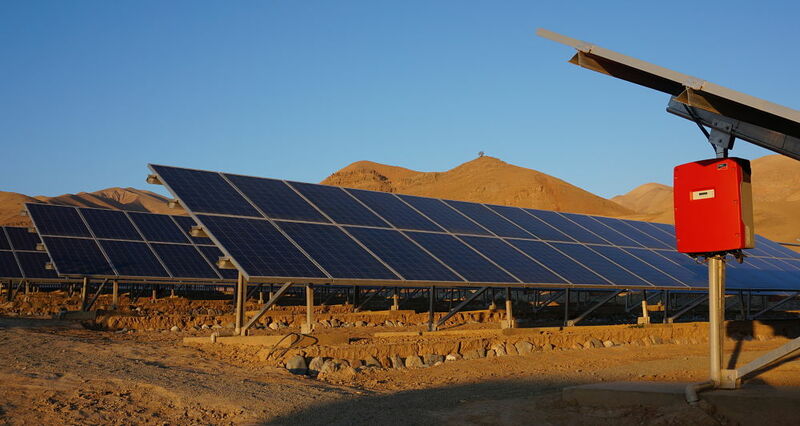 Objectives include designing rural energy projects together with sustainable institutional framework, ensuring the sustainability of these projects through capacity building, creation of community funds, and establishment of service centers for O & M. The main outcome of C1:SC2 is to develop alternative energy sources in order to reduce the pressure of solid biomass in rural areas of Afghanistan. It is estimated that, in ten years, 10% improvement will be met. RREP is drafted by MEW and MRRD with the strategic objective of creating better social, economic, and environmental conditions for the rural population of Afghanistan. Specific objectives of RREP are to increase income generation of households by increasing energy access, provide affordable, clean, and sustainable lighting, heating, and cooking devices reduce health and environmental impacts of energy use and improve opportunities for income generation, poverty alleviation, and energy efficiency. To attract private sector involvement and promote the sustainability of rural renewable energy projects, the government has to introduce certain regulatory measures such as the introduction of legal frameworks for pricing and tariff structures, the establishment of procedures to integrate local renewable energy schemes to the national grid, creation of power purchase agreements, and grid codes. Safety and quality standards need to be developed by ANSA in coordination with MRRD and MEW regarding power generation, transmission, and distribution. Biogas will be promoted to replace the use of fuel wood and animal wastes as sources of energy for cooking. Emphasis will be given to research to increase efficiency and to reduce the cost of household biogas production technology, including development and dissemination of community and institutional biogas plants. The establishment of biogas-related information centers will be encouraged in coordination with local institutions. Technology for the production of biomass gasification will be developed and disseminated through technology transfer. Consumption of biomass will be reduced and efficiency of fuelwood stoves is enhanced by expanding the use and local production of fuel-efficient stoves. Poor institutional framework and infrastructure at the subnational level for rural energy promotion, lack of consumer awareness on the benefits and opportunities of renewable energy, financial, legal, regulatory, and institutional barriers, low capacity for the promotion of renewable energy technologies at all levels of government, private sector and nongovernmental organizations, and a strong focus on meeting the basic energy needs rather than focusing on production uses of energy for income generation are identified to be some of the barriers to the development of renewable energy in Afghanistan. ANREP was drafted with the initiation of MEW’s Energy Policy and Renewable Energy Directorates and the technical and financial support of GIZ with the overall objective of deploying and utilizing renewable energy sources in an optimized manner. ANREP’s targets have focused mostly on electricity generation with a limited focus on affordable and efficient cooking and heating devices run on either renewable energy sources or traditional biomass. However, its scope includes all sorts of stand-alone systems and devices for thermal energy. Fortunately, biomass energy projects are on the list of priority projects that need to be implemented. ANREP sets a power target of 4500 MW–5000 MW by 2032 but not any thermal energy targets. ANREP is supposed to be implemented in two terms: Term I (2015–2020) and Term II (2021–2032). The objective is to support PPP for the development of renewables in the first term and in the second term is dedicated to the full commercialization of renewable energy development. With regard to institutional arrangements for the implementation of ANREP, it is expected that an Interministerial Commission on Renewable Energy (ICRE) would be established to oversee the implementation of ANREP in the first term and this entity would develop into an independent decision-making authority on renewable energy sources in the second term. ICRE is versioned to have statutory authority and be established by a presidential decree. In addition to ICRE at the national level, Zonal Renewable Energy Centers (ZRECs) will also be created to oversee the implementation of ANREP in various zones of Afghanistan. RRES outlines Afghanistan’s rural renewable energy action plans until 2020 and development objectives until 2032. RRES focuses on the development of renewable energy sources for the economic development of rural areas through increasing energy access. The main emphasis is on sustainable electricity schemes. However, nonelectrical energy needs are also covered. RRES was planned to be acknowledged by MEW and MRRD and published by December 31, 2014. However, as for now, it is not yet published. MEW-RED is the responsible body for the implementation and advancement of RRES and is also responsible for overseeing the milestones specified in RRES. MEW-RED is expected to lead the implementation of RRES in close collaboration with MRRD-REED and the rest of the stakeholders in the sector. RRES is meant to be a “hands-on approach” to address energy needs in rural areas and describes how measures determined by ANREP and RREP are implemented. It is intended that by 2020, Renewable Energy Development Authority (REDA) is established that would act as an independent implementing agency of renewable energy projects. MEW-MRRD Technical Working Group (TWG) needs to be continued. MEW-MRRD needs to continue ICE Subcommittee on Rural Electrification and Renewable Energy (ICE-RE).